● NAD : NAD+ is a coenzyme naturally produced by the body that is associated with anti-aging. Our NAD+ IV Treatment is 500 mg of NAD+ typically infused over 2-4 hours. The Body Bar’s NAD+ IV therapy offers a variety of benefits. Studies suggest that NAD may slow the aging process, leading to a healthier and younger-looking you. This coenzyme boosts neurologic function, restores mental clarity, supports brain regeneration and repair, and increases energy metabolism on a cellular level. NAD may also help improve symptoms of anxiety, fatigue, and depression. The benefits of NAD don’t stop there. 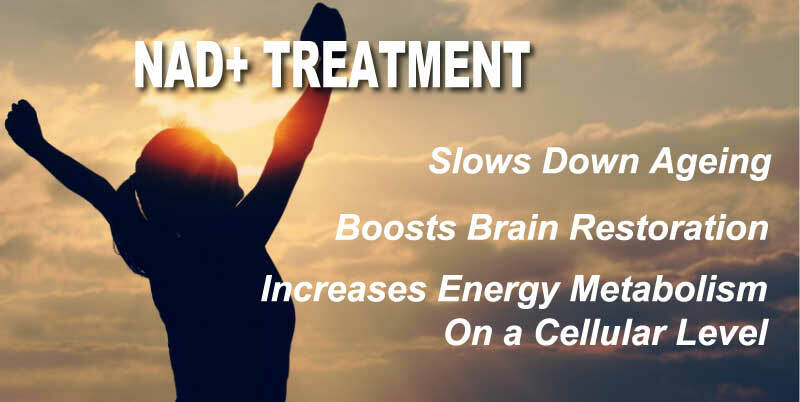 NAD+ IV therapy has been found to benefit individuals in addiction and recovery programs by helping to reduce cravings, restore nutrients typically lost in substance abuse, and promoting brain repair.